What an interesting week we have had in the forest! The weather threw everything at us, torrential rain one minute and glorious sunshine the next. 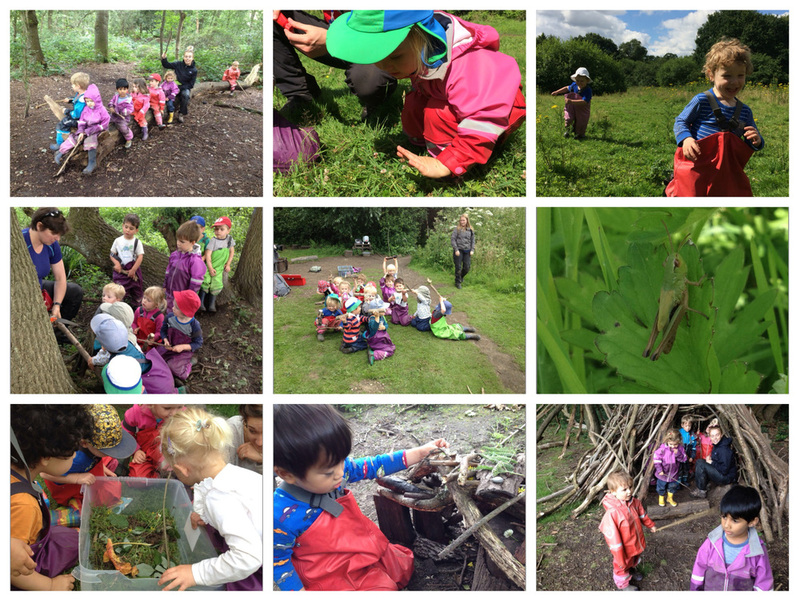 In true Little Forest Folk style the children and staff have enjoyed it all in equal measures! We have been exploring much more of our site this week as our base camp has been temporarily out of bounds and it has been the most wonderful opportunity to encourage the children to develop new interests outside of their usual favourite activities. How lovely that we can encourage children to share such care and concern for living creatures on a daily basis! We have been introducing some adult-led experiences based on the children’s interests this week. These have been so successful that we will continue to offer these experiences alongside all the wonderful child-initiated activities that occur naturally. We have made a beautiful Little Forest Folk flag using natural paintbrushes (sticks, flowers and shrubbery) to apply paint to a large piece of fabric and also adding treasures the children have found in the forest. This is now at the Scout Hall. We have also made kites, using string to attach sticks to form a frame; a very tricky activity for little fingers, the children showed such brilliant perseverance and it really paid off! We have also made boats with the children, using a palm drill to form a hole for the mast. We took these down to the river to test them but after spending so long making them (and rightfully, feeling very proud of their efforts!) some children were reluctant to place these in the water in fear that they might float away. We will revisit this activity with them in future and try testing them in the small pond on our site to alleviate any risk of wayward boats! This afternoon a group of children were supported to make their own miniature version of the forest! They collected various items to place in a large box and were encouraged to work together and share their ideas about what they might need to build their forest. A really lovely activity to promote their skills in negotiation, problem-solving, understanding of the natural environment and social communication. We have begun our reflective sessions back at the scout hall which is going as well as could be expected after one week! The children really seem to love looking back on the photos from the day and talking about their favourite forest activities. It's also great to have the treasures we bring back from the forest as tactile items to keep the more fidgety hands busy while we talk about why they have chosen to bring back these special items. We really appreciate your support as we get the children used to this new way of doing things at the scout hall, they are doing brilliantly so far! It's the end of term next week so we will say goodbye to all of our sessional children who will be off to enjoy their summer, and we look forward to seeing you again in September. The first day of the new term will be Monday 5th September. Please remember that we will be closed on Tuesday 6th September for a staff training day. This weekend we wish Philip, Natalie, Katherine and Stephanie good luck as they begin their Forest School training. 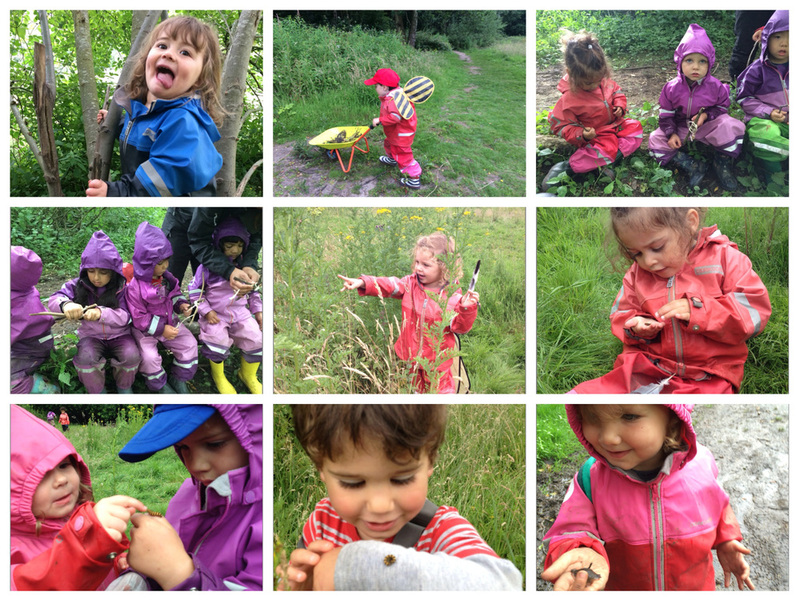 We hope that you will soon be able to see real benefits of having so many Forest School trained practitioners on site! According to the weather forecast next week is also going to be a warm one with Monday and Tuesday forecast to be as hot as 28 degrees! Please remember to pack a sunhat in your child’s bag and apply their first layer of sun cream before drop off. We will keep all lost property for one more week until the end of term before taking it to the local charity shop. Please do have a rummage through and claim any items! We have a big bag full of just water bottles so if you are missing any then do come and have a look. This is available every weekday evening in the Scout Hall between 4-6pm. Wimbledon - Puddle! Puddle! Puddle! Wimbledon - Dramatic, impressive, inquisitive!